An odd letter made its way into the Charlottesville Daily Progress today. Years ago when Oliver North opposed John Warner in the Republican primary, I was a Democrat who never sought to meddle in Republican elections. But I knew that my senator was going to be a Republican, no matter who won the party’s primary, because my party had no competitive candidate. So I voted in the Republican primary, fearful of what outcome might ensue from the victory of such a controversial character as North. I have never regretted my vote, and I have always been grateful that Virginia law allows all voters to participate realistically in the future of the state and nation without restrictions on what party they may have belonged to. The problem with that example? Oliver North never challenged John Warner for the Republican Party of Virginia's nomination for the U.S. Senate, in a primary or through any other method. John Warner ran unopposed for the GOP nomination in 1990, and he had no Democratic opponent in the November election. Nancy Spannaus, a devotee of political cult leader Lyndon LaRouche, was the only other candidate on the ballot that year. Warner beat Spannaus by sweeping every county and city and earning 80.9 percent of the vote. The absence of a Democratic general election candidate that year may be what Mr. Hawkins is trying to recall in his letter to the editor. In 1994, Oliver North sought the Republican nomination for the U.S. Senate and winning it in a convention against former Reagan administration official James C. Miller III. There was no primary election that year, and John Warner was not on the ballot. North went on to lose the general election to incumbent Democrat Chuck Robb in a three-way race that also included independent J. Marshall Coleman. That election was the subject of a popular documentary film, A Perfect Candidate. In 1996, Jim Miller challenged John Warner for the nomination in a primary election but Warner won and went on to face Democrat Mark Warner in the general election. 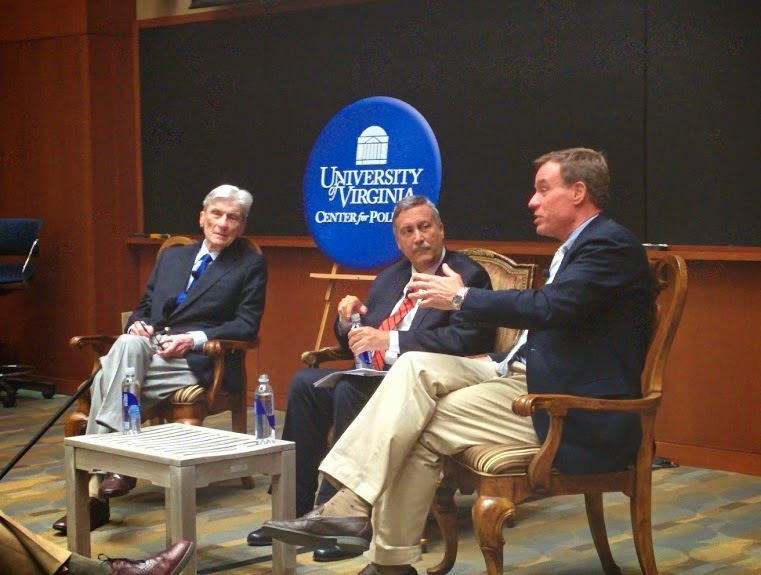 After serving one term as Virginia''s governor, Mark Warner eventually won John Warner's U.S. Senate seat in 2008, after John Warner decided to retire. The two of them remain on friendly terms (as seen in this video from earlier this year) and, in fact, John Warner has endorsed Mark Warner's re-election bid this year. Regardless of what one thinks about the merits of Mr. Hawkins' argument about open primaries, it's important that the person making that argument have his facts straight. For that matter, it is the responsibility of the newspaper's editors to ensure that such factual errors do not make their way into print.